The Cleveland Cavaliers fought a tough and perhaps the most competitive Game of the series to sweep the do or die Toronto Raptors in Game 4 of the 2nd Round of 2017 Conference Semi-finals. The home team gave the defending champion a hard time in their final Game, fighting for their season to stay alive despite one of their all-star player Kyle Lowry did not play due to injury that he suffered in Game 2. Despite the good fight gave by the Raptors, it was the Cavaliers, who are more determined to win the game as they are the first team in the East to book their spot in the Eastern Conference Finals and awaits the winner of the series between the #1 seed Boston Celtics and #4 seed Washington Wizards. In the 1st quarter, the Raptors taste their biggest lead of the series with 12 points, but failed to hang on to their lead and ends the quarter tied with the defending champ 28 – 28. In the 2nd quarter, the Cavaliers started to pull away lead by their leader LeBron James, who finish the half with16 points, 5 rebounds and 5 assist while Kyle Korver, who has the hot hands in the quarter also ends the half with 16 points, shooting 4 out of 6 in 3PM. The Cavs lead 61 – 49 at the half. In the 3rd quarter, the Raptors show some life by coming back lead by Serge Ibaka and PJ Tucker the Raptors cut the Cavs lead into single digit to end the quarter 80 -85 Cavs by 5 point lead. In the final quarter, the Raptors regain their final lead of the game after a made 2 point jump shot by Ibaka and a foul from Kevin Love to give them 93 – 92 edge with 6:38 remaining in regulation. But Kyrie Irving carried the team scoring his 10 straight points to give the champion a 10 -2 run to regain the lead 103 – 95. Since that run it has been all over for the Raptors seasons. 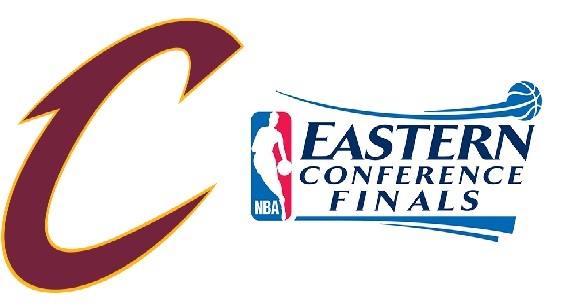 Finals score Cavs 109 – Raptors 102. The Cavaliers win gave them their 3rd straight appearance in the Eastern Conference Finals and their 2nd sweep of the 2017 post season and for LeBron James this will be his 7 straight Eastern Conference appearance since in a Miami Heat uniform. James, ended the game with 35 points, 9 rebounds and 6 assist. All four games in the series James average a 30 plus points a game. No Comment to " CAVS Backs Again in ECF for the 3rd Consecutive Time "